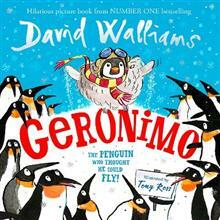 The next FABULOUSLY FUNNY picture book from NUMBER ONE bestselling David Walliams. Illustrated by the artistic genius Tony Ross. ... view full title details below. The brand-new HEARTWARMINGLY HILARIOUS children's picture book from NUMBER ONE bestselling David Walliams. Illustrated by artistic genius Tony Ross. Meet Geronimo - the baby penguin who has one dream and one dream only - and that is to fly! But everyone knows penguins can't fly... or can they? With a little help from his dad and friends, baby Geronimo discovers that even the wildest of dreams can come true. 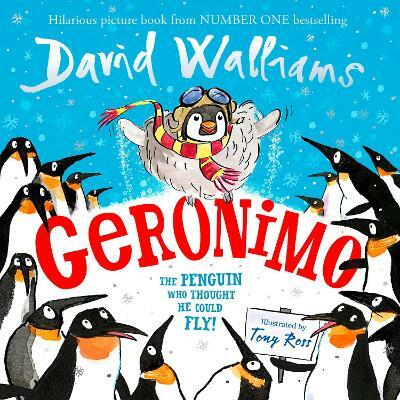 A delightfully topsy-turvy book with an uplifting message about following your dreams - another blockbusting classic from David Walliams and Tony Ross! David Walliams - comedian, actor and author - continues to take the children's literary world by storm. His tenth novel, BAD DAD, was an immediate number one, following the triumph of THE MIDNIGHT GANG, the biggest-selling children's book of 2016. WORLD'S WORST CHILDREN 2, which published in early 2017, spent four weeks at industry number one and eight weeks at the top of the children's chart. They have achieved unprecedented critical acclaim - and RATBURGER, DEMON DENTIST and AWFUL AUNTIE have all won the National Book Awards Children's Book of the Year. David's books have now exceeded 100 non-consecutive weeks in the children's number-one spot, and have been translated into 53 languages, selling more than 24 million copies worldwide. Born in London, Tony Ross went to art school in Liverpool. His cartoons have appeared in famous publications the world over. His first book, HUGO AND THE WICKED WINTER, was published in 1972. Tony has since written over 100 books and illustrated over 2000! His creations Towser and The Little Princess have been turned into TV series. David and Tony have worked on six bestselling picture books together, as well as eight of David's phenomenally successful children's novels - BILLIONAIRE BOY, GANGSTA GRANNY, RATBURGER, DEMON DENTIST, AWFUL AUNTIE, GRANDPA'S GREAT ESCAPE, THE MIDNIGHT GANG and BAD DAD. David and Tony also collaborated on the 2017 World Book Day title, BLOB, and the two blockbuster short story collections, THE WORLD'S WORST CHILDREN and THE WORLD'S WORST CHILDREN 2. This preview is indicative only. The content shown may differ from the edition of this book sold on Wheelers. Subscribe now to be the first to hear about specials and upcoming releases. NZ Children's Book Awards Finalists - Order Now!